Because there are so many photos of this trip (over 7 MBs), I have broken them down into several pages, each containing "thumbnails" of larger photos. Click on a "thumbnail" to see a larger version of a photo. You are free to make reasonable use of any photos I've taken and published on these pages. Here’s a guy who has been to Ecuador and posted his experience and many photos on his personal Web site. Mr. Baird took his three-week trip in the Fall of 1998. Through words and images he fills us in about the Galapagos Islands, Quito and the surrounding area, Mindo and La Selva (the Amazon Jungle). It is obvious he had a good time, as did we, in reviewing this section of his Web site. There are explanations and captions to most of the pictures, but not all, which was the only drawback of these pages. So, if you are planning a trip to Ecuador or you’re just curious about someone else's, have a gander at these pages. 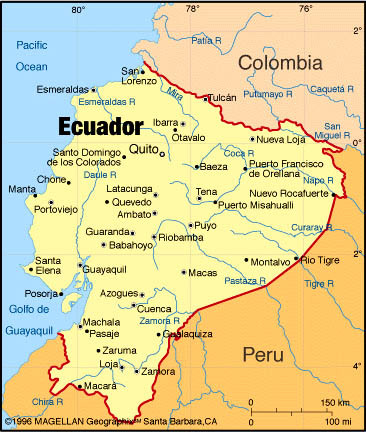 Sonorama's Ecuador Pages interesting site for background information on Ecuador.